Whether a fish is timid or bold may determine how it is likely to be captured, says research conducted at Queen's University Biological Station. KINGSTON, Ontario -- A fish's personality may determine how it is captured. This association between personality difference and capture-technique could have significant evolutionary and ecological consequences for affected fish populations, as well as for the quality of fisheries. Anglers fishing near rocky outcrops or in areas of water with submerged vegetation may be more likely to catch timid fish, while those fishing in open water may be more likely to reel in bolder fish, according to new research conducted at Queen's University Biological Station. "Boldness�the tendency of an individual to take risks�is one personality trait of considerable interest to behavioral biologists," explains lead author Alexander Wilson, a visiting biologist from Carleton University. "Ours is the first study to have characterized a relationship between capture technique and individual boldness in a wild population of fish." 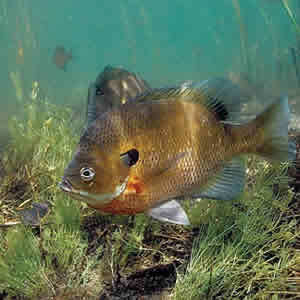 The researchers examined the personalities of bluegill sunfish caught by two different capture techniques � angling (a hook attached to a fishing line) and beach seining (a long net that is dragged through water to encircle fish). Fish caught in the wild by angling were more timid than fish captured in the wild using a seine net. However, when a group of fish captured by seine net was then released in a large outdoor pool and angled for, it was the bold individuals who were most often caught in the open. According to Dr. Wilson, these findings make ecological sense. Despite spending equal times angling in open water areas and in areas with refuge, the researcher caught more fish in the areas with refuge�a habitat that appeals more to timid fish. On the other hand, beach seining or angling in open water are both capture techniques that are more likely to target bolder, risk-taking fish. This research was recently published in the Canadian Journal of Fisheries and Aquatic Science.